I have an off-white suede couch with a deep chocolate ottoman and white coffee table and end table. What color should I paint the walls? The carpet is champagne and I also have an accent chair that looks kinda like honey which I would also like to use in the living area. I love color, usually rich ones. I suggest you stick with the basic color scheme that you already have. Shades of sand and honey work well with chocolate brown so I see no need to add in any other color. 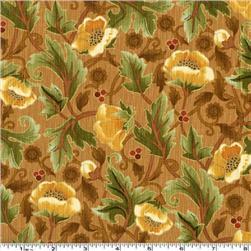 Why not try to find a fabric that brings it all together - such as the one pictured above. You could use this fabric to make a couple of throw pillows for the sofa or perhaps a stylish wall panel. I would use this sparingly though and for the other cushions and drapes I would stick with you basic colors but with plain fabrics and maybe add in some different texture – velvet curtains, suede cushion covers and a sheepskin rug for example. As you mention you like color Susie, you may also like to consider painting a feature wall in a rich shade of gold.